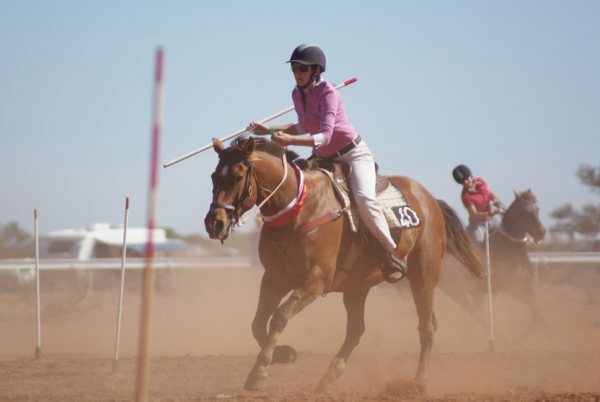 The Landor Races are the Eastern Gascoyne Race Club’s traditional bush race meeting. The meeting is held annually in the third term school holidays (October) at the racecourse near Landor Station. The meeting has a colourful history and truly outback flavour. In 1921 at a combined mustering camp, which was the custom in those days, a number of stockmen from stations in the area from Milgun, Mt Augustus, Mt Seabrook, Erravilla and Landor were having a day off. These men were resting and doing their washing when they started to argue about who had the fastest horse. Following discussions with interested parties from the surrounding stations, the EGRC was formed and the Landor tradition was born. The event has now been run annually almost continuously since 1921, except for several years during the World War 2 and has been run on the same principles since the early days – that it is a strictly amateur race meeting for local station horses and riders. There are no starting gates at Landor – all races are “walk up starts”. A 28 member committee comprised mostly of local pastoralists conducts the event and meets three times a year on stations throughout the district. A comprehensive EGRC Club Constitution determines the operation of the event with races under the rules and regulations of RWWA. The race meeting is open to RWWA registered horses that are classified as North West Bred (i.e. horses bred above the 28th parallel), District Qualified (i.e. have spent six months prior to the meeting above the 28th parallel) or Corn Fed Horses (Class D horses that have not won a race on a Metropolitan track). Jockeys must be licensed track riders and although local station employees are preferred the committee will permit other bonafide amateur riders with the approval of the Steward. Nowadays, the Landor weekend begins with a race day on Saturday – the Ladies Bracelet is the feature event. Sunday is the traditional Gymkhana day. The action starts in the morning with the kid’s “lead on” events and finishes with the adult’s competition in the afternoon. This is followed by the fun events of the “Tug of War” and foot races for everyone. Monday is the big race day, with the main event being the Landor Cup. However, you can join the crowd for social polocrosse in the morning before the races begin. Race days are tremendous fun in the outback, with fashions ranging from moleskins and shirts, Akubras, fillies in frocks, mares dressed up, with hats of course. Watch the final of the $1000 barrel race. Bookies on course. Music throughout the day. Evening entertainment can be found at the Two-up table or in the hall dancing or just standing around the bar renewing old acquaintances.